So Long Dullness, Hello Youthful Zest ! Yellow is the color of energy and vitality, of joy and summer. Could a perfume express all that? Let`s see in the following lines. 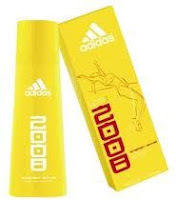 Energy Game by Adidas is a floral fragrance for women launched in 2008, celebrating the Olympic Games of the mentioned year. This limited edition comprises top notes such as green apple, litchi and orange, middle notes like magnolia, osmanthus, basil and lotus, ending with the woody accords of musk. Aqua Allegoria Pamplelune by Guerlain was launched in 1999 and it`s a citrusy delicious scent. It opens with a mixture of lemon, grapefruit and bergamot , then it develops with the aid of some petit grain and black currant, ending triumphantly with vanilla, sandalwood and patchouli. We continue our fragrant trip with Bali Sunrise by Girard, a floral fruity scent dedicated to distant beaches and lounging careless in the sun. This vacation-like breeze is made of pear, grapefruit, orange, mandarin orange and Amalfi lemon as top notes-what a delicious cocktail, followed by a trio of flowers-jasmine, lily and tincture of rose and it ends with some woody notes, among them sandalwood, musk, patchouli and vetyver. Eau D`Energie by Biotherm is a floral fruity scent launched in 2006. Its top notes are citruses, orange and mandarin orange, middle notes are apricot, jasmine and cyclamen, final notes are musk and cedar. Les Nuits D`Hadrien by Annick Goutal belongs to the citrus aromatic olfactive group, but what strikes you most at a first glance is the stylish bottle, both coquette and girly. Launched in 2003, this fragrance is a wonderful blend of Artemisia, Sicilian bergamot and green mandarin as top notes, then basil, caraway, cypress and juniper as middle notes and ending with amber, vanilla, patchouli and musk. There are so many wonderful perfumes that suggest youthful energy and joie de vivre, that is why we`ll continue to introduce them to you in the near future.